Your wedding stationery will depict the style of your wedding to all of your closest family and friends. that will help personalize your suite and make it completely yours. These little pieces are my favorite part of the process. 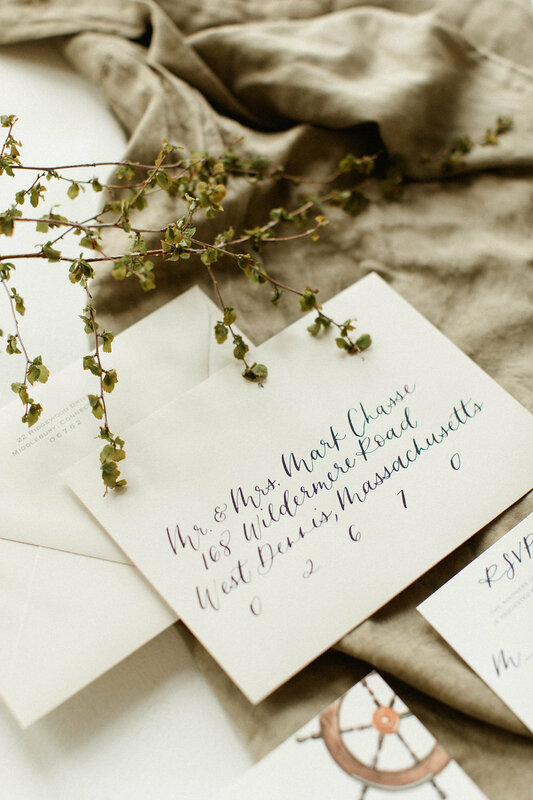 Calligraphy can be brought in with many different styles, and really set the tone for your stationery design. We can use it on your envelopes to send off to your guests, on certain areas of your invitation cards, and even in your day-of stationery to carry your theme throughout. Whether they are floral or fruit, landscapes or objects, adding in soft watercolor paintings to parts of your stationery can bring in the pop of color you are hoping for, without overwhelming your guests. Mimic your bouquet or a small object you hold dear, we can add little touches of elements you love. These are great additions to place on your stationery across the board, and to save for after as well. Add the design to your Thank-You cards for a fresh design, new from a wedding photo, or add it to your cocktail napkins for house parties, either way a crest will always be uniquely yours. In a line drawing or watercolor version, depicting where your wedding will take place is a beautiful reminder of why you chose the location to start with. Keep the original to frame on your walls of your new home together as well.